Come to Castle in the Air this Thursday, Dec. 5, when Tinsel Trading owner Marcia Ceppos hosts an over-the-top trunk show! 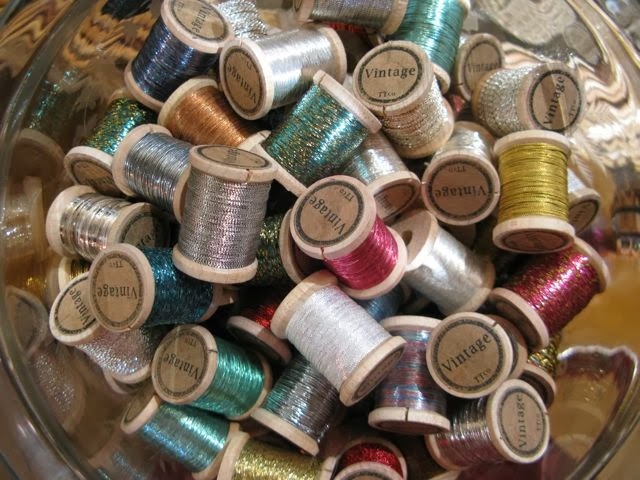 Tinsel Trading, the oldest trim store in NY is bringing a trunkful of treasures to show & sell. Marcia Ceppos owner of a this 3rd generation business will be giving a short talk on the history of these materials and the various uses before the sale commences. Included will be a fabulous assortment of antique and vintage trims great for creative projects - sewing, collage, picture framing, ornaments, jewelry to name a few. Materials such as metal threads, boullion, tassels, ribbon, trim and appliqués will be presented, most made in France and Germany circa 1900-1930. A free gift of a spool of antique metal thread will given to 25 people. Of course, we love everything Tinsel Trading has to offer, from glass glitter to fabric flowers to special wonders just for the holiday season. If you’re smitten too, we hope to see you on Thursday. You guys are offering astoundingly fun events! WoW! Castle in the Air is pure Fantasy! Lucky locals!